Postcard JP-621600 from Japan shows each of the 12 months in a year and its associated custom and activity. I also found a web page that explains the names of months in Japan. 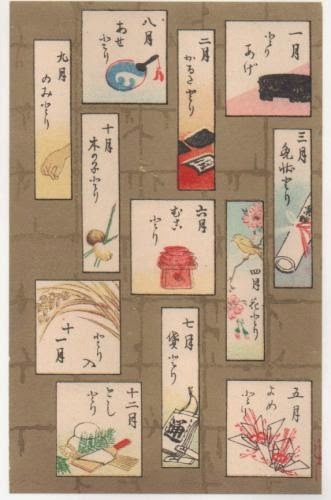 Japanese people have a custom of sending New Year's Day postcards (年賀状) to update and greet their friends and relatives whom they could not meet with often in the past year. The Japanese Post Office (日本郵便) guarantees the delivery of the New Year's Day postcards on January 1 if they are posted before the deadline. Coincidentally, this card found its way to my mailbox on December 31, 2014.